Opponents of Maine’s new health care reform law (PL90) erroneously describe the law as “a gift to the insurance companies.” In reality that gift has come in the form of more stable markets spurring investment and opportunities for insurers to compete for market share. Therefore, the real winners are the Maine small businesses and consumers who enjoy more choices and lower priced health insurance options. This study looks beyond the regulations to highlight the practical impact PL90 is having for end users, the businesses and consumers who purchase private health insurance in Maine. This is a measure all too often dismissed by critics yet perhaps the only measure that truly matters. The following case studies illustrate the effects of specific provisions of PL90. Names have been altered for confidentiality purposes, but the profiles are of real companies and individuals. All material details presented in the case studies are accurately portrayed. PL90 is demonstrating who truly benefits when we free our markets to respond to consumer needs, the many individuals and small businesses in Maine who rely on private health insurance—a 56 year old woman with a newly transplanted heart able to afford her anti-rejection medications, a small business lowering their cost rather than accepting a 23 percent rate increase, and another small business able to continue providing health insurance to its employees without having to ask them for a premium contribution. PL90 contained numerous provisions aimed at improving Maine’s individual and small group health insurance markets. The Maine Guarantee Access Reinsurance Association (MGARA) was created to subsidize high cost claimants in the individual health insurance market. MGARA assesses $4 per month from policyholders across all insurance markets in Maine raising approximately $25 million. This fund is supplemented with premiums paid by insurers who have high cost individuals in the reinsurance pool. Once an individual is designated to the reinsurance pool, MGARA reimburses the insurer after the first $7,500 of claims paid, 90 percent of the next $25,000 of claims paid, and 100 percent of claims paid in excess of $32,500. MGARA is transparent to policyholders who are unaffected by the program in terms of their coverage and premium cost. In most cases, policyholders are likely unaware that they are in the reinsurance pool. Their plan choices are the same as any other policyholder and their premiums are the same as a healthy individual of the same age and gender. Jane Doe, a 56 year old single woman, worked for a small Maine employer who offered a group health insurance plan covering Jane and four additional employees. In the fall of 2011, Jane suffered a massive heart attack. The attack resulted in significant irreparable tissue damage and left Jane in and out of consciousness for months in an intensive care unit first in Maine and then a hospital in Boston. She was eventually released after months of hospitalization with a pump surgically implanted in her chest that circulated her blood while she waited on the heart transplant list. Jane overcame many odds simply by surviving, but she would not be returning to work. During this timeframe Jane applied for and was approved for social security disability. She must now wait two years before she can apply for Medicare. Her employer generously maintained her group insurance coverage for the maximum timeframe allowed under the group insurer’s eligibility rules. Because this is a small employer ineligible under the Consolidated Omnibus Budget Reconciliation Act (COBRA), Jane found herself needing to seek coverage in the individual insurance market. Jane’s biggest challenge in affording individual health insurance was out-of-pocket costs. She had sufficient savings to cover her monthly premium cost but worried about the plans additional out-of-pocket expenses. Many plans have deductibles and out of pocket limits in the thousands and occasionally in excess of $10,000 annually. Jane was able, however, to purchase a new individual product offered by Anthem, compatible with a Health Savings Account (HSA), that limited her annual out-of-pocket exposure to $2,600. It has been years since Anthem, Maine’s largest individual major medical insurance provider, has introduced new products. The individual market has been steadily deteriorating, raising alarms the market could collapse entirely. The Maine Bureau of Insurance issued a white paper detailing this problem in 2000 which was updated in 2001. MGARA has breathed new life into the individual health insurance market. A viable market attracts investment as has been demonstrated by Anthem who introduced this new HSA product in addition to a portfolio of new products Anthem refers to as “HealthChoice Plus” with premiums as much as 72% lower than products previously available. Since MGARA became operational in July of 2012, Anthem saw new products sales increase approximately 60 percent over the same timeframe in 2011. PL90 created a more stable individual health insurance market. The result was new investment by a Maine insurer that provided invaluable coverage for an individual in need. The small group health insurance market in Maine includes several insurers who compete for market share. Because of this, it is typical for small companies to shop their insurance coverage each year to make sure they are getting the best price. As an insurance broker, I can tell you that small companies change insurers and products frequently, sometimes literally on an annual basis. PL90 not only instituted MGARA and changes to insurance rating rules, it also removed barriers to new products and investment. One provision lifted a somewhat obscure Maine law that prohibited individual Health Maintenance Organization (HMO) deductibles in excess of $1,000. As a result, multiple insurers offered new small group HMO products including Maine’s non-profit health insurer, Harvard Pilgrim Health Care. ABC Architecture is a small firm in southern Maine with a dozen employees. They offer health insurance to their staff of which ten participate. Their plan renews each year on January 1st. This year they faced a 23 percent rate increase from their insurer which translated to a premium increase of over $8,300. As shown in Table 1, instead of a 23 percent rate increase, ABC Architecture experienced an 11 percent rate decrease saving the company over $4,000 over 2012, and over $12,000 compared to their premium cost had they renewed with their existing health insurance plan. ABC Architecture shopped as they do each year and changed to one of Harvard Pilgrim’s new HMO products. The coverage was almost identical with only a $50 increase in their employee’s annual out-of-pocket exposure. This was a Health Savings Account (HSA) compatible plan like their previous plan, but it included an enhanced prescription benefit. 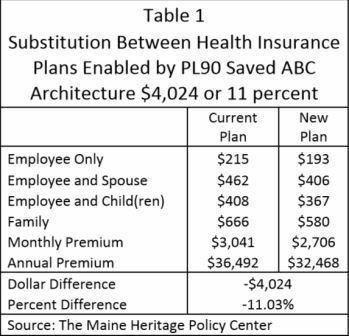 The chart below, prepared by the Maine Bureau of Insurance, shows a growing trend of health insurance rate decreases rising from less than 3 percent before PL90 to 9.4 percent in 2011 and 17.5 percent in 2012. The percentage of small businesses experiencing increases dropped in every category and the substitution effect tells us that many more companies changed products or insurers to further mitigate costs.The substitution effect of companies changing insurance plans is an important aspect of the small group health insurance market. It demonstrates that many companies change plans and insurers to avoid or mitigate rate increases. Given that fact, when you see data regarding rate decreases, the numbers are invariably understated. One PL90 provision enabled the formation of a health insurance captive which allows companies to band together to manage their health insurance expenses. One group in Maine, the Maine Wellness Association, took advantage of this provision and formed a health insurance captive called MaineSense. MaineSense provides a new option for Maine companies with a number of unique features such as employer ownership in the program. XYZ Builders is a commercial building contractor in central Maine. The company has provided health insurance to its 20 employees for many years. They still pay 100 percent of the employee premium though rate increases are threatening their ability to continue doing so. 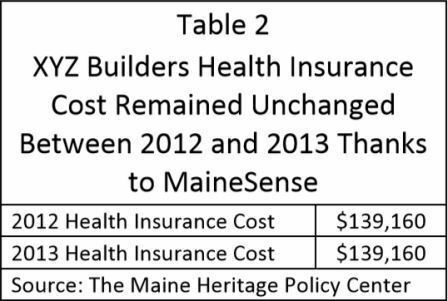 Concerned about historical health insurance rate increases and interested in the opportunity to participate in what they viewed as an innovative new program, XYZ Builders joined MaineSense in January of 2012. Doing so the company held their cost level with 2012 while improving their coverage. PL90 created the opportunity for the Maine Wellness Association to launch a new program. That new program translated to a choice for XYZ Builders that did not otherwise exist. Not only did XYZ Builders enjoy participation in an innovative program of which they are now a part owner, they have experienced two years of equal or lower health insurance costs, an uncommon experience for a Maine small business.The employee single plan out-of-pocket limit fell from $3,500 excluding prescription out of pocket costs to $2,550 including prescription out of pocket costs. January first of 2013, XYZ Builders renewed their plan unchanged with MaineSense at a 1% premium decrease. Creating viable, competitive health insurance markets should not be viewed as a “gift to insurance companies,” but instead should be recognized for what they truly are—a gift to the consumers who purchase through those markets. When we focus on policies that stabilize our insurance markets, we see rates begin to stabilize, investment in new products, heightened competition, and innovative market entrants. We also see a 56 year old woman with a newly transplanted heart able to afford her anti-rejection medications. We see a small business lowering their cost rather than accepting a 23 percent rate increase. We see another small business able to continue providing health insurance to its employees without having to ask them for a premium contribution. PL90 is demonstrating who truly benefits when we free our markets to respond to consumer needs, the many individuals and small businesses in Maine who rely on private health insurance. Joel Allumbaugh is the Director of the Center for Health Reform Initiatives at The Maine Heritage Policy Center. He may be reached at JAllumbaugh@mainepolicy.org. Crisis to Cure is a series of publications by The Center for Health Reform Initiatives which focus on patient-centered reforms to America’s health care system that will keep personal medical decisions between patients and their physicians – without government interference and intrusion. All information is from sources considered reliable, but may be subject to inaccuracies, omissions, and modifications.